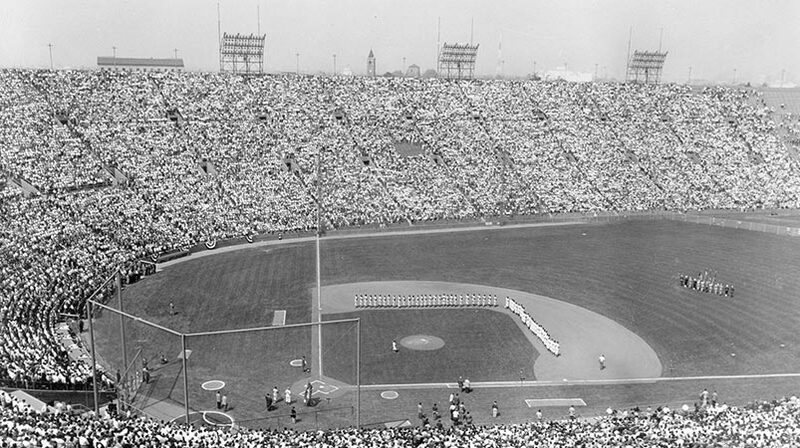 A vision of the future was dancing in his head and O’Malley shared it to the world in 1952, when he agreed to build a permanent home stadium at Dodgertown. He knew the original agreement was to expire in 1953. The Dodgers would sign a 21-year lease agreement with the City of Vero Beach, whose officials had voted unanimously, to make Dodgertown their spring training headquarters during the week of January 31, 1952. The agreement enabled the Dodgers to “renew for an additional period of 21 years.”Julie Autumn Luster, 2002 Dodgers Spring Training Yearbook, “Holman Celebrates Half a Century” No other major league club had a longer running spring contract. The terms of the lease were $1 a year for 21 years, which O’Malley, a non-practicing attorney, paid in cash upfront to avoid a lot of legal issues in the contract. It would be the first major statement that had been made by the Dodgers that indeed they were there to stay. The terms “called for the Dodgers to have their team in Vero Beach at least 15 days each spring. A certain number of exhibition games were to be played, the Dodgers were to pay the city $3,000 to complete the debt on the swimming pool and earmark the entire receipts from one exhibition game for the airport fund.”Joe Hendrickson, Dodgertown A Vero vote of confidence and one appreciated by the local city fathers, who immediately realized the financial, public relations and hospitality impact of O’Malley’s commitment. O’Malley never scaled the pinnacle of superiority in his actions, as could be seen by every one of the ballplayers at Dodgertown. When the many minor league teams descended on Dodgertown and table service reverted to cafeteria style, the Dodger chief and his wife, Kay, stood in line with their aluminum trays for food in the mess hall dining room just like everyone else. Class D ballplayers waited in line shoulder to shoulder with Class B, major leaguers and the Dodger President himself. That was one of the most unique facets of Dodgertown and part of the reason for its success. This was no nameless, faceless organization, but one that gathered the “troops” together and made everyone feel a part of the larger family. By meeting and talking with the masses of individuals each day, the Dodgers became stronger and more unified. The plan O’Malley devised for Dodgertown was to systematically upgrade the entire complex, maintaining the basic features that made it work from Rickey’s regime and enhancing it to become more player and fan friendly. He believed the more players felt at home at Dodgertown, by catering to their every need, the less likely they would wander off base for outside entertainment. O’Malley wanted to have the most state-of-the-art spring training complex, with the best training techniques, meals, medical facilities, stadium, landscaping and recreational facilities. A player might never leave base during his stay, except to attend a weekly religious service of his choice. And the Dodgers even provided bus transportation for that. Although the goal never changed, which was to address the well-being and conditioning of the players while preparing them for the season, O’Malley saw opportunity in Dodgertown, that the real beauty of it was that it could be a self-contained retreat, not just for a couple of months in the spring but with year-round possibilities. 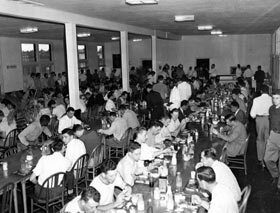 Dodgertown’s mess hall is the gathering point for all hungry players, staff and executives. But, feeding the masses cafeteria style meant waiting in line and eating in shifts. Walter and Kay O’Malley stood in line holding their aluminum trays shoulder to shoulder with the players. 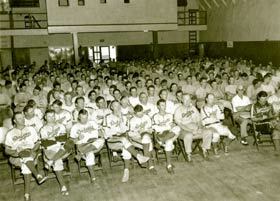 Dodger players attend a baseball skills class in the old Dodgertown auditorium. Branch Rickey’s initial vision for a training camp included educating the players about all aspects of the game. 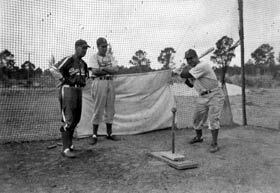 Dodger hitting instructor George Sisler (l-r), Duke Snider and Pete Reiser are practicing at the batting tee.